What are the benefits of cooking activities for team building? Amid the blood, sweat and tears of a professional kitchen, creating a functioning team is essential. It is the cornerstone of any successful restaurant; more important, perhaps, than the merits of the menu, service and ambience put together. If the kitchen is not able to deliver, then everything else quickly falls down. Over time chefs and restaurateurs – the good ones at least – have developed rigorous systems and workplace cultures designed to foster teamwork and productivity. Of course, these are not 100% foolproof - in such an intense environment things will always go wrong - but there is plenty to learn from the ones that do get it right. Even for businesses where the tools of the trade are computers rather than knives. So, what are the benefits of cooking activities for team building? A strong leader provides a figurehead for the rest of the staff to look up to and learn from. In a professional kitchen, head chefs usually fulfil this role, often conducting affairs from the pass – the point at which waiters collect the dishes from the kitchen – where they are well placed to iron out any kinks in the process. As well as taking control of operations, the head chef is responsible for both discipline and motivation – two vital elements of a recipe for team-building success. In any business it is essential that each member of the team is given a clearly defined set of responsibilities. This avoids the issues of people stepping on each other’s toes and prevents whodunnits when things do go wrong. Many kitchens still work to the “brigade system”, an innovation of legendary French chef Auguste Escoffier around the turn of the 20th century. The brigade system, perhaps inspired by Escoffier’s time as an army chef, splits the kitchen into “stations” and delegates tasks according to a strict hierarchy. Under the system, every cook is accountable and knows their place in the team. That the brigade system is still going strong over a hundred years on from its conception says a lot about its efficacy and the importance of giving staff clear responsibilities. For an individual to remain motivated, there has to be a balance between prosaic tasks and those that encourage their creativity and develop their skills. And so although a commis chef (the lowest ranking member of the brigade) may be peeling onions for most of the day, the head chef may give them a few hours in the afternoon to work on a new dish or learn an essential technique. A great way of keeping staff motivated – essential for a high-performing team – is to have them working towards some clear objectives. Even better if those objectives can be shared by all. Head chefs, ambitious by nature, are usually targeting something for their kitchen – be it a third Michelin star or just a favourable review in the local paper. Once these have been achieved staff feel rewarded for their hard work and team morale is enhanced as a result. Never underestimate the power of a team that enjoys its time together. Ask a chef why they choose to work in such a low-paid, high-pressured and occasionally hazardous industry and they’ll almost certainly point to the camaraderie that exists in a professional kitchen. But how to foster camaraderie? Head chefs may organise staff days out or get-togethers after work. Perhaps they will have a mentoring scheme in place whereby more experienced team members are paired up with rookies. The trick is to find out what works for your business. Though the brigade system encourages team members to take individual responsibility there are moments when others are going to need to step in and help, especially if things are going wrong. Good head chefs actively encourage their staff to help each other and there is no doubt that a crisis averted can do wonders for the morale of both the team member under pressure and the kitchen as a whole. 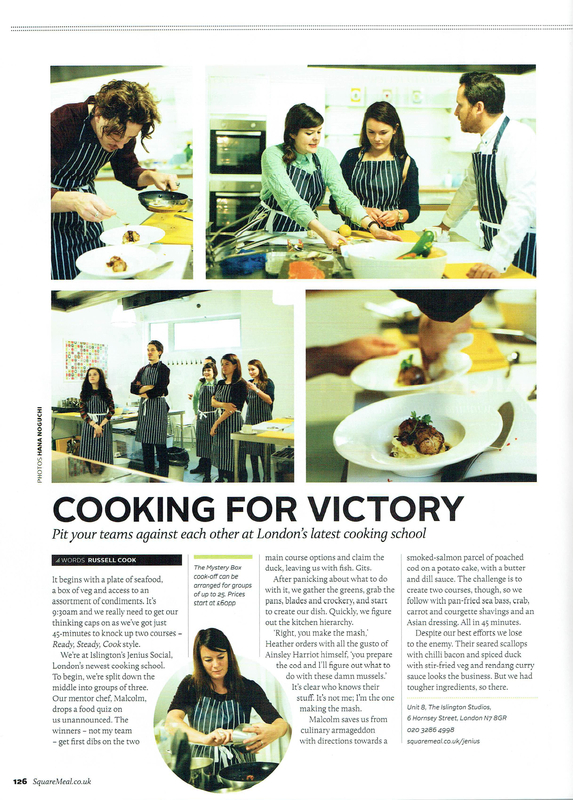 Here at Jenius Social we regularly help businesses to discover the true art of team-building through cooking. Speak to us today about what we can offer your business, or read our team-building brochure for more details. One of our most popular team-building formats is the Mystery Box Challenge, reviewed here by the folks at Square Meal, where attendees are split into teams and tasked with creating a magnificent dish from a box of ingredients. As ever, teamwork is everything. Do you need to hire a flexible meeting room for your team? We can provide the perfect space and onsite catering for your business meetings or workshops.